The Launch Pad: It’s No Joke…… STEM Education is Real! It’s No Joke…… STEM Education is Real! Now onto the real STEM discussion….. You may have seen pictures recently on The Launch Pad of one of the many 2010 FIRST Robotic Regional Competitions taking place around the US. Well, these were posted by Google Lunar X PRIZE staff that visited the FIRST Regional Competition held in Long Beach, California. Along with getting to observe the amazing competition between robots playing a form of soccer on a field, we also got a chance to walk around the pit area and visit with the teams. The teams are made up students who are mentored by engineers, teachers and business leaders. They had 46 days to brainstorm about solutions to design and develop their robot to compete at this regional event. I cannot even begin to tell you how incredible the teams were. Seeing our future scientists, engineers and entrepreneurs at work was very inspiring. Personally, the best aspect of the day was to hear these youth share their experiences about how they got involved in FIRST and how specialized education programs have helped paved their path in wanting to pursue careers in STEM. 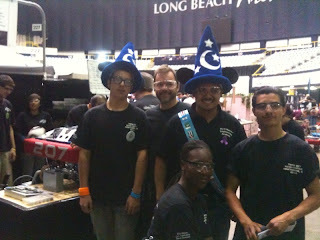 Many local and out of state high school programs were represented in Long Beach. One in particular caught my attention. Hawthorn High School has formed an Engineering Academy at their school. One of the projects that youth work on is to develop a robot for FIRST. Jeff Ordway, a teacher at Hawthorn High School relayed to us that “students are told everyday that they can’t do things. This program shows them something different.” Many students also relayed to us their aspirations of going to college and wanting to major in Engineering. Having this academy at their high school has helped pave the way to reach their dream. There are approximately 250 youth attending the Engineering Academy at Hawthorn High School, and it is expected to grow to 500 youth next year. Posted below is a somewhat blurry, but cool shot of the team from this Academy. I am proud to share that STEM education is real and is truly making a difference not only at this high school, but with many high schools and after school programs involved with FIRST. I am now even more excited about my trip to Atlanta, Georgia to see the FIRST Worldwide Championship on April 15th, and am getting very eager to announce one of the first Google Lunar X PRIZE partnership challenges. Stay tuned!